Spring training’s just around the corner. Time to whet the appetite for America’s pastime. 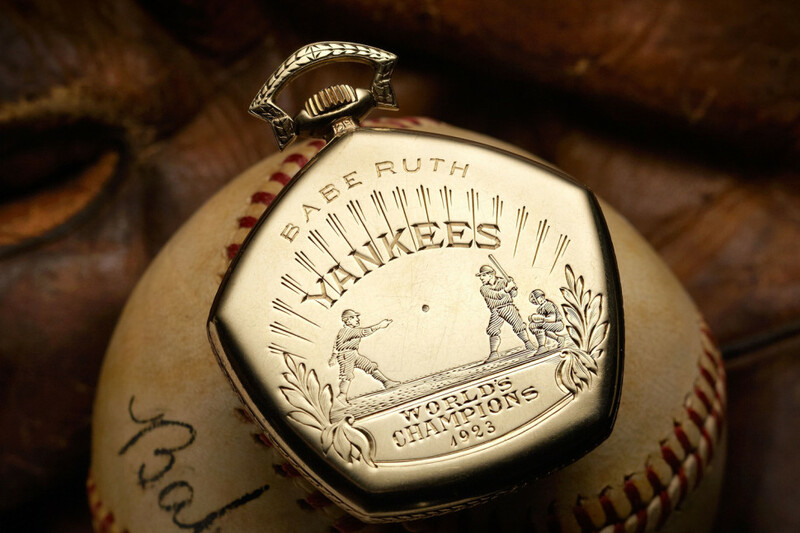 Gaze upon Babe Ruth’s 1923 New York Yankees World Championship Watch. It’s not a replica, it’s the real deal and it’s up for auction. How much? Bids are at $240,000 right now, though experts project the final bid to be around $750,000. Whoever buys this will get so much history. The Babe held onto this watch for most his life, but then he struggled with terminal cancer. At that point, he asked one of his closest friends, Charlie Schwefel, if he wanted anything from the Babe’s collection. Like Gollum gazing upon the ring, Schwefel probably pointed to this watch with eyes wide open and said “that”. And so the Babe gave Schwefel this 14k gold watch. The case features an artfully engraved scene of a pitcher, hitter and catcher, with a ball sailing through the air. It passed through a few hands before resting in a private collection. Maybe it’ll end up in your own collection soon.